Miss Pelicano: Welcome! Day One. Hello and welcome to my very first post on my very first blog! I am Miss Pelicano! This blog will be mostly about sewing. My sewing stuff and others'. I started sewing sometime in february this year, inspired by a very talented crafty blogger, Constança at Saídos da Concha. Since then I have also been inspired by many other very talented crafts people and their amazing blogs. 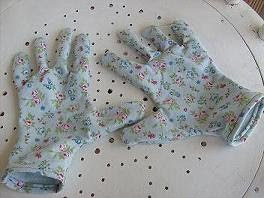 My partner has also encouraged me to continue sewing and to create this blog. For him I have so far made two neck ties. Photos up soon! I won't be a fluent blogger as I have little time over but I'll try to show the things I'm making, ask for advice and hopefully exchange ideas and inspiration with you. I'm from Portugal but I've been living in Sweden since 1996. My partner is English and we have two young boys. I am a Montessori teacher currently doing some further studies in education at Höskolan Dalarna in Sweden. The photo for the banner shows the gardening gloves I made from Heather Ross' Weekend Sewing. The fabric I used was from a girl's dress I bought in a second hand shop. More sewing from that book will follow on other posts! 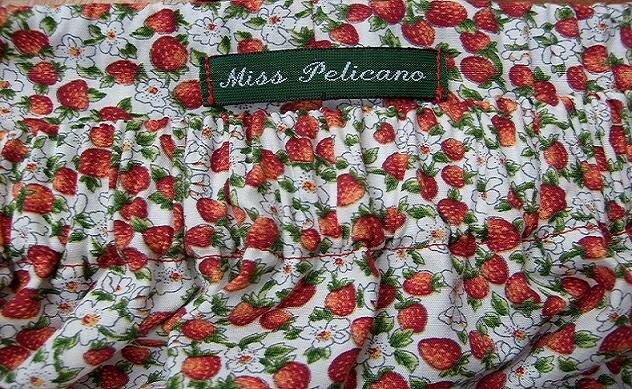 Why the name "Miss Pelicano"? My name is Barbara Pelicano Soeiro. At the school where I have been teaching the children call me Miss Pelicano. It wasn't my first choice for the name of this blog, but after many, what I thought were original ideas, I realised that nothing is original anymore except your own name! Anyway, "Miss Pelicano" will remind me of all the wonderful children I have taught! And now having taken two years off to study it's nice to have that memory! I hope you enjoy this time with me! You are welcome to send a link of my blog to your friends and quote me on anything you find interesting, but I would appreciate it if you do not use my photos. Thank you! 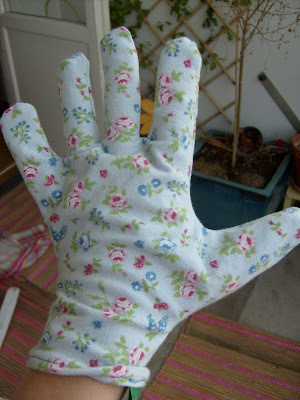 I'm a novice in sewing and blogging. As you will see the quality of the photos isn't the best, a bit fuzzy. when you CLICK ON EACH PHOTO the photo is enlarged and the quality is actually better. What am I doing wrong? Olá! sou amiga da Joana e foi ela que me indicou o teu blog. Anseio por ver as tuas obras de arte. Beijos.